“On a tight budget, are ya? Well, y’all have come to the right spot. The first thing I want to mention is that we only deal in the fine products of the Chrysler Corporation, ever since my granddaddy opened this place back in ’48. Best-engineered cars in America, at least until the dang Germans and Eye-talians took over. “Now over here we’ve got a cherry ’51 Dodge Meadowbrook. Simple, honest car that’ll never let you down. This one was bought new off this very lot by a little old lady who drove it twice a week for 15 years, sold it to another little old lady who drove it once a week for twenty years, then sold it on to a little old man who, bless his soul, had a stroke at the wheel just about a mile down the road. The car rolled into the fence in front of Preacher Jackson’s place, and that’s why it’s got that little blemish in the front. That’ll buff right out. “Oh, you want something with a little giddyup? OK, how about this immaculate ’64 Chrysler 300? 383 V8, she’ll flat fly. It got hit one time on the right side, but we would never sell a car with a defect like that, so we managed to find a door from a Newport that fit perfectly. And it’s even the same color! “Too much of a gas hog, you say? Well…come around back and check out this ’65 Dart. Slant 6, three-speed manual, and it’s Resale Red, as they say in the business. Just needs a little detailing. I’m showing it to you now because once it’s out on the lot, I guar-an-tee it’ll be gone in 60 seconds, haw haw. “Too small? (Sigh) All right, well, we aims to please. This is the one I drove in from home this morning. ’68 Dodge Polara hardtop, 318 for economy, Torqueflite for reliability and that incomparable torsion-bar ride. What did you say? Does it have air? Well, no, but it’s white and when you roll down the windows and swing those side vents around, it’s the next best thing to A/C…OK, I see. Well, let me show you one more. This one I know you’ll like. “Isn’t she a beauty? ’80 Diplomat, a rare two-door, mind, auto, factory air and a half-vinyl roof for that touch of extra class. When you come rolling up to Bud’s Suds in that thing, the chicks will go wild. Don’t ask me how I know, haw haw. I can put you in it for, oh, $1750, or 36 payments of $80 a week. For an extra hundred, we’ll paint the wheels body color. How’s about it, shall we do the paperwork? “What, you’re interested in the Mazda GLC? No way, man, that’s a stone classic. You can’t afford what I’m asking for that baby…oh? Okay, well, come back next week, I’m sure we’ll have just the car for you. Depends on whether the GLC is a sedan or a (one-year-only in the US) five-door hatch. Hard to tell at this angle with the Dip blocking it. GLC looks to be a sedan, based on the C-pillar shape. Yes, to everything you said! I have never even seen one of these before. I’ve never seen one of those before! I’ve seen a few late LeBaron coupes of the same squared-off style, but the Diplomat version? Well I think that’s a new one to me too. I’ll take the Polara, and if you’ve got an old Dodge pickup or van with a 360 and A518 transmission kicking around, we’ll work out a package deal. One of each, please. 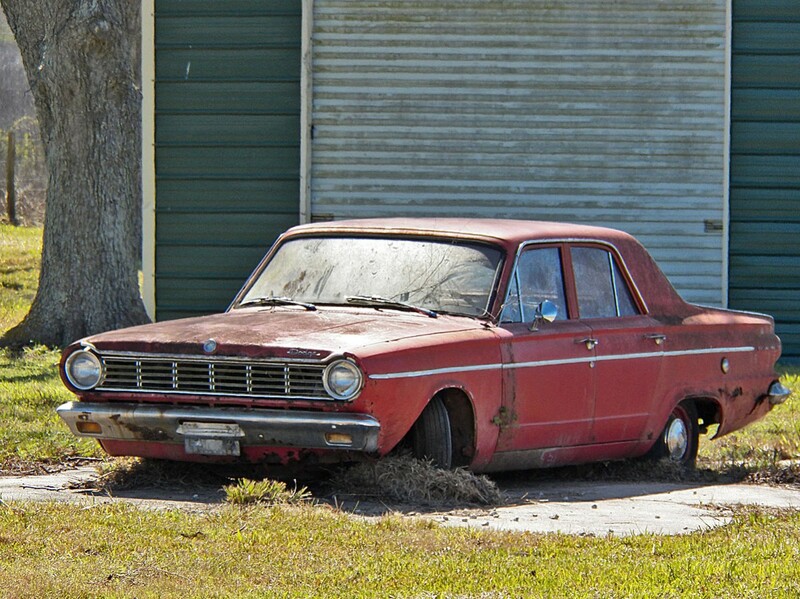 Except for maybe the Dart – that looks like a lot of serious rust for a Texas car. A friend owned a 51 Meadowbrook, which is the one Fluid Drive Mopar I have actually driven. That one may be my pick of the bunch. That Diplomat, if it is indeed an 80, is painted in Baron Red. I know this because that was the color of the 80 Omni that my mother had on order for months at Glenbrook Dodge in Fort Wayne. Oddly, the promised car kept not being on the trucks that it was supposed to be on. I am sure that the two price increases between contract signing and the car’s multiple disappearances had nothing to do with it. Had a summer job at a steel mill way back and one of my co-workers had ’50 or ’51 Dodge with Gyromatic transmission, Dodge’s name for Fluid Drive. Was my first inkling that these semi-autos ever existed. I was fascinated that it had a clutch and what looked to be a column shifter, but you could just put it in 2rd and it shifted automatically to third without using the clutch (or so I recall). These were very complex and seemed like a lot of effort to engineer for just one automatic shift. By 1952 I think every manufacturer had a fully automatic except Chrysler, which never got one until 1954. Wonder why they were so late to the game when GM had Hydra-Matic since 1940 and Dynaflow since 1948? Even Chevy had Powerglide in 1950. It’s been decades since I drove one but IIRC you shifted once , it shifted twice , making it a four speed semi – automatic . I realize many here might say dual range two speed but in the end , four different ratios on tap makes it a four speed , not a dual range two speed . Cars and pickups marked ‘ Fluid Drive ‘ were simply three speeds with a torque converter , I had those too . You say I’m not gettin’ my keys back (free safety check) until I buy a car. Polara, please. My parents had a 51 Dodge that was a twin to the car pictured here. It was replaced by a 55 Ford Country Sedan that was red with creme on the upper part of the doors. I’d take the red Dart, though I’d prefer a 2 door to this 4 door. Funnily enough, I found my 69 Valiant on the back lot of a small town Chrysler-Plymouth dealership. 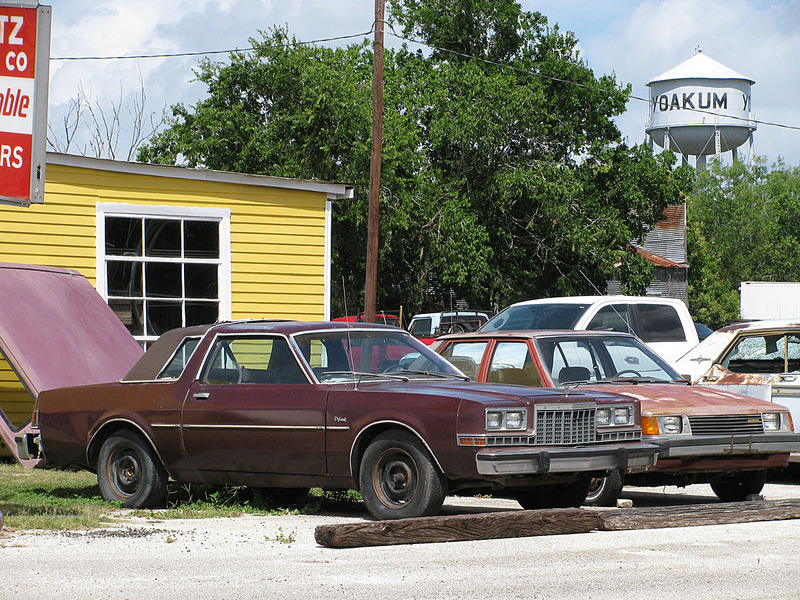 Having lived in a smallish Texas town in the early 80s, you did occasionally stumble across used car lots on the edge of small towns and cities. And finding oddball import sedans or sports cars out in the middle of “nowhere” wasn’t too difficult, either. 12 months no quibble guarantee? GGH06: This is one glorious find of a CC-lot. The GLC and the Meadowbrook are appealing to me. 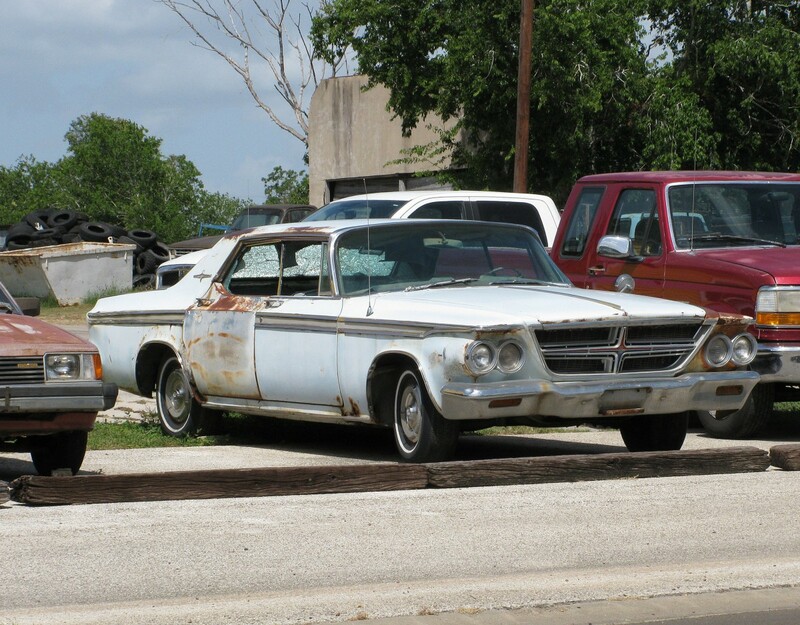 Well, truth in advertising, the Polara was photographed in Victoria and the Dart in El Campo. The rest really were in Yoakum, as the water tank attests. Lived in Beeville in the 80s and I thought these pictures reminded me of Victoria. There was 1 used car lot there that always had 3 or 4 really neat/semi-oddball imported cars near the front of the lot. I bought my 914 at the Buick dealer in Victoria, though I probably should have bought the Audi Fox wagon I saw on a lot a few miles away. Cool shots and a fun read. Throw me the keys to the Polara please. I’d like to take it around the block. Meadowbrook for me, so I can drive with my hat on! Wrap that Polara up I’ll take it, I aint got air in my Hillman either but the little quarter vents work a treat, must disconnect the heater in that too now that summer is approaching and the on/off valve has failed. 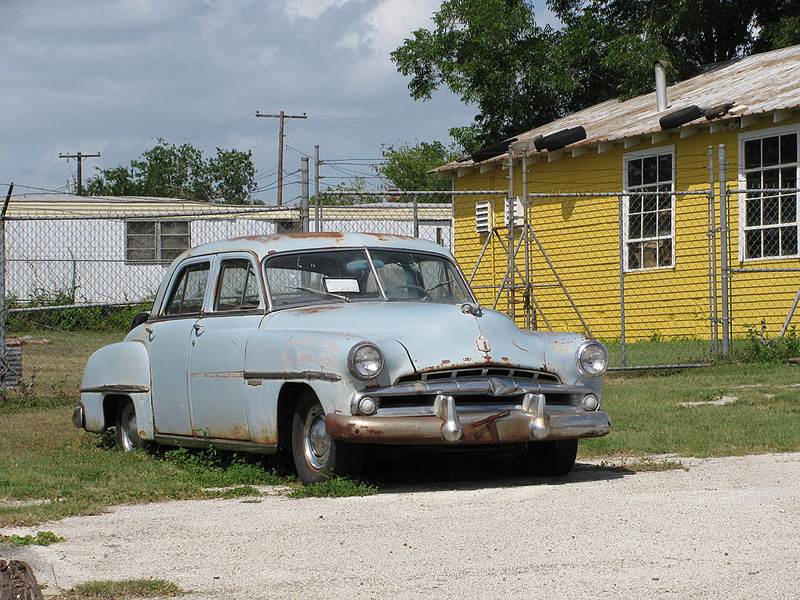 When I was growing up my grandparents had a 1952 Dodge sedan, complete with the Fluid Drive. Obviously this was many years ago but I remember it as being incredibly slow (especially as driven by my grandmother), and also incredibly reliable. I honestly don’t ever remember them having to spend any money on the car, other than on consumables such as tires, brakes, etc. I never got to drive the Dodge as it was sold after my grandfather died and my grandmother went to live with my uncle and his family for a while. It was purchased by one of my father’s co-workers who drove it to work on a daily basis through the 1960’s. It’s a tossup between the Dart and the Meadowbrook….. Does the Meadowbrook have Giromatic or overdrive ? =8-) . The one I drove was the plain vanilla Fluid Drive fluid coupling mated to a straight 3 speed stick. Here is another blue Dodge in about the same shape as the lead in to this writeup. Hold that ’64 Chrysler 300 for me. My dad had a 2 door 383 version in the mid ’80s and it would really giddyup! Pushbutton Torqueflite, dontcha know. The scary thing for me is that I can remember when all of these were new, except the Meadowbrook. I even remember the CHP having ’68 Dodges. I really like the Dart, except it is rather rusty. 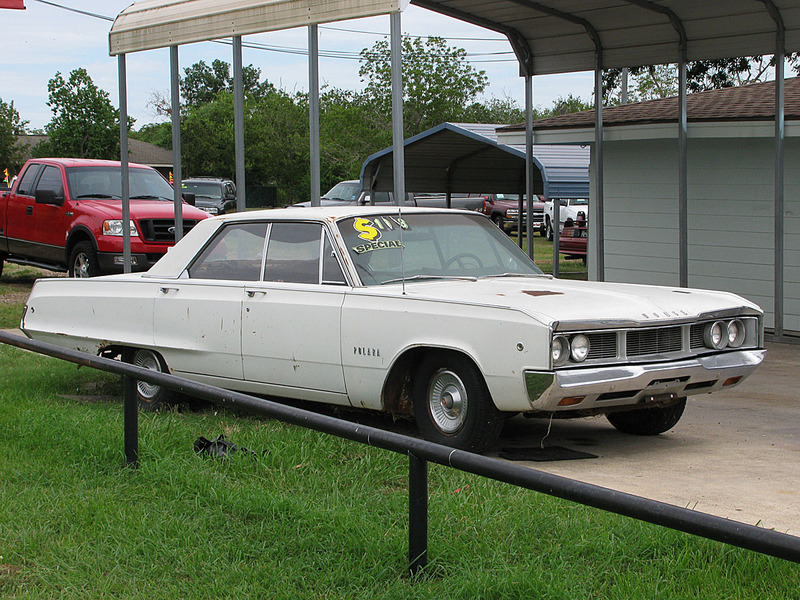 With so many guys biting that Polara, I guess we are going to auction it. If it runs decently, I would start with 5 K bid.. 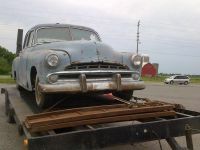 If it was in better condition I would’ve said the ’64 300, but the ’51 Dodge is probably easier than that to get roadworthy. Smashed glass and rusted out sheetmetal on the 300, and that’s just what we can see in the picture. I’ll take the Polara with or without air. I always liked the big ’60’s Mopars, and it looks like it would make the trip up to Ontario just fine. I’d just have to find somewhere to store it for the winter…our salty roads aren’t kind to an old classic. If I had to take one car of the four displayed I would try the Dodge Polara. I am (and have been since that Polara was new) extremely anti-Chrysler anything. I could try to live with the Polara but my fuse would be very short. As for the others, I would rather stick with one of my Schwinns and would refuse to accept the Chrysler at no cost. Do you still have the diplomat? If we made a deal could you ship?